It’s hard to overstate the immeasurable legacy left behind by Nina Simone, one of jazz music’s most inventive and resilient icons. Born on this day, February 21, in 1933, Simone quietly produced an output of almost two dozen albums spanning classical, blues and early R&B, while channeling bold social commentary and civil rights activism through her work. While she only received two GRAMMY Award nominations in her lifetime (and two posthumously), Simone’s artistry continues to earn newfound meaning through the music of countless contemporary artists, documentaries and books. Today, as part of our ongoing celebration of Black History Month, we’re taking a look at why Nina Simone’s contributions to music are cemented in history. Born in Tryon, North Carolina, Simone demonstrated remarkable talent at an early age, learning to play the piano at just three years old. Learning classical music while singing in her church choir gave her a unique musical sensibility, one which only grew stronger as she trained at the Juilliard School of Music. When she applied to attend the prestigious Curtis School of Music in Philadelphia, however, Simone’s application was denied. Disheartened by the fact that this may have been on account of racial discrimination, she migrated to Atlantic City, New Jersey, to perform live and fund private piano lessons. Not originally intending to become a singer, Simone began pairing her brilliant piano skills with her distinctive, smokey voice so she could earn more money as the resident performer at Atlantic Bar & Grill. The success of her debut album, Little Girl Blue, released on Bethlehem Records in 1958, foregrounds much of Simone’s illustrious style. Her vibrant singing, equal parts assertive and melancholic, took cues from her predecessors like Billie Holiday and Ella Fitzgerald, most notably on her hit cover of the Gershwin classic, “I Loves You, Porgy” (released on Little Girl Blue.) Simone’s approach to playing piano set her apart completely – in songs like “Love Me or Leave Me,” it’s hard to miss the Bach-esque fugue section that appears in the middle of the song. Such a daring fusion of classical and jazz was entirely fresh at the time, and became Simon’s calling card as her career continued to grow with more albums and record deals. Simone held an unequivocally strong stance on social justice. A frequent performer and speaker at civil rights marches like the Selma to Montgomery March, her voice joined those of other jazz greats who paved the way for equality in the United States. 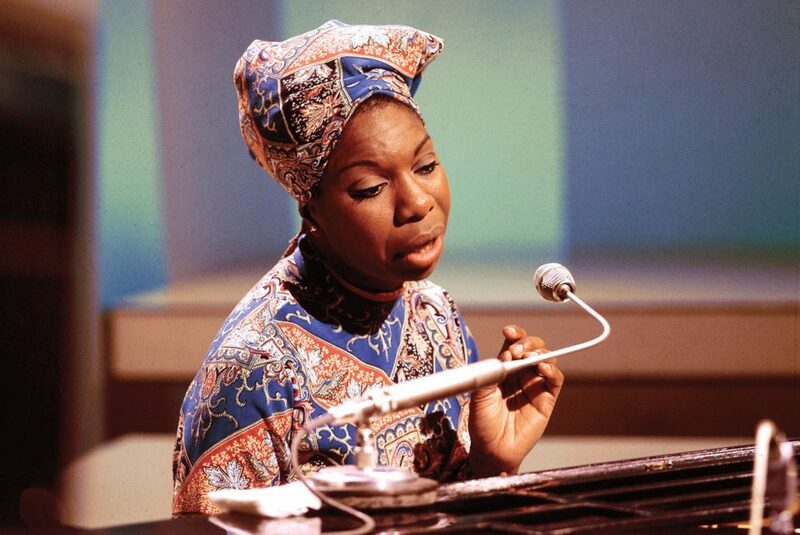 “Mississippi Goddam,” a powerful, grief-stricken tune that marked her debut on Philips Records in 1964, was a commentary on the 16th Street Baptist Church bombings in Alabama in 1963 and the first of many Nina Simone songs that wore activism and social awareness on its sleeve. Her poignant lyricism also highlighted the intersectional struggles of being an African-American woman, such as “Four Women,” which criticizes Euro-centric beauty standards. Songs like “To Be Young, Gifted and Black” and “Ain’t Got No” are powerful, life-affirming anthems that display pride in the face of inequality. This entry was posted in Beyond Levitt, Holidays and tagged Black History Month, jazz, Nina Simone on February 21, 2018 by Rounak Maiti.